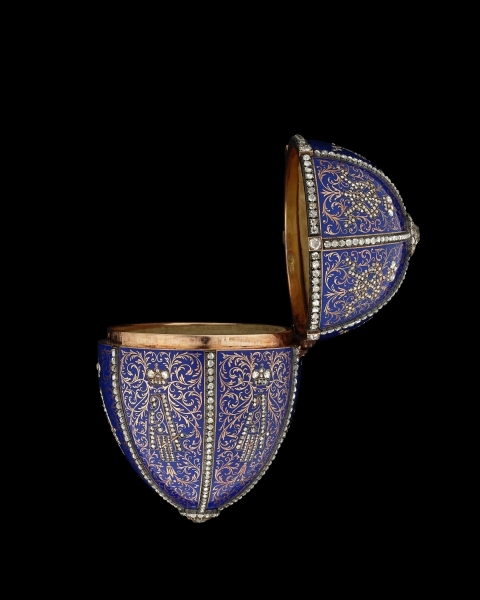 Treasures created by the firm of Peter Carl Fabergé (1846-1920) have inspired admiration and intrigue for over a century, both for their remarkable craftsmanship and the fascinating histories that surround them. Featuring over 100 objects, Fabergé Rediscovered will unveil new discoveries relating to Hillwood’s own collection of Fabergé imperial Easter eggs and other famed works, highlighting new attributions and provenances and providing a new framework to study and understand 19th- and 20th-century jewelry and goldsmithing. The special exhibition will display the greatest examples from Hillwood’s Fabergé collection, left by Marjorie Merriweather Post for the benefit of future generations, along with important loans from other museums and private collections, including the Metropolitan Museum of Art, the Musée d’Orsay, the McFerrin Collection, the Edouard and Maurice Sandoz Foundation, and His Serene Highness Prince Albert II of Monaco. The famous discovery in 2014 of a long-lost imperial Easter egg—Tsar Alexander III’s 1887 Easter gift to his wife, Tsarina Maria Fedorovna—by a scrap metal dealer in the Midwest not only made headlines, but also prompted new findings about Hillwood’s own collection. Newly uncovered facts relating to the rediscovered egg confirmed that Twelve Monograms Egg, long believed to have been made in 1895, was actually one of the two imperial Easter eggs fabricated in 1896. The fascination with Fabergé continues to uncover new facts and discoveries about the storied jeweler to the court of St. Petersburg. Hillwood’s collection has been the focus of study for several of its curators, beginning with Post’s curator, Marvin Ross, who published a book about Hillwood’s Fabergé in 1965. Anne Odom published on Hillwood’s Fabergé collection in 1996, and was the last to do so. Current chief curator, Dr. Wilfried Zeisler, conducted research into Hillwood’s archives, at the Bentley Historical Library in Ann Arbor, where Post’s archives are housed, and in Russia to bring to light more of the collection’s history and Post’s early interest in Fabergé for this special exhibition and accompanying publication. Marjorie Merriweather Post began collecting art in the first decade of the 20th century. In furnishing her New York apartment, she adopted a taste for 18th-century French style, which was the design trend of the day. The first Fabergé pieces she collected can be seen in the context of her new-found interest in French decorative art, particularly as they aligned with the criteria she developed for collecting: They were beautiful, finely crafted, and were associated with royalty. Post acquired her first Fabergé piece in 1927 from the New York branch of Cartier. The 18th-century amethyst quartz box, which had once belonged to Prince Felix Yusupov, bears on its gold lid the marks of Fabergé. It would have interested Post for its precious materials and prestigious history. 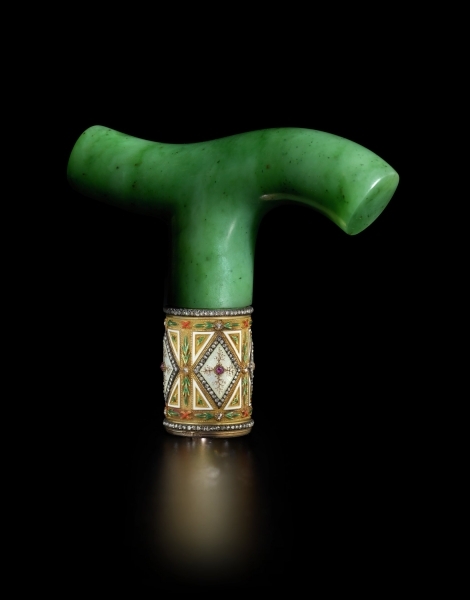 The second Fabergé item to enter her collection, and the first with an imperial connection, was a nephrite cane handle, set in gold and decorated with enamel, diamonds, and rubies. A note accompanying the piece signed by Grand Duchess Xenia Alexandrovna, the last tsar’s sister, verifies that it once belonged to her. In 1931, Eleanor Barzin, Post’s middle daughter, acquired the Catherine the Great Egg from Hammer Galleries as a birthday gift for her mother. A tribute to French design, the egg aligned with Marjorie’s interest in French 18th-century gold and enameled boxes. When she departed for Moscow with her husband, diplomat Joseph E. Davies, in 1937, when he was appointed U.S. ambassador to the Soviet Union, Marjorie was already thoroughly acquainted with the history of the Romanovs and their jeweler Fabergé, having already acquired these three impressive examples. With the possible exception of a rare wood display case with silver mounts, it does not appear that Post purchased any Fabergé objects during her time in the Soviet Union. The discoveries of other Russian treasures she made there, including porcelain, silver, enamel, and liturgical objects, did ignite a passion for Russian art, including the works of Fabergé, that would fuel her collecting for the rest of her life. Dr. Wilfried Zeisler is Hillwood’s chief curator. He is a graduate of Sorbonne University and the École du Louvre. Zeisler has written extensively on the decorative arts in France and Russia, including a 2010 book on ceramics. His dissertation, L’Objet d’art et de luxe francais en Russie (1881-1917), was published in 2014. He has participated in and curated exhibitions in Paris and Monaco. At Hillwood, he curated Splendor and Surprise: Elegant Containers, Antique to Modern (2015) and Konstantin Makovsky: The Tsar’s Painter (2016). Zeisler co-authored the latter exhibition’s accompanying book, Konstantin Makovsky: The Tsar’s Painter in America and Paris (2015). A full-color, 224-page companion catalog of the same title and authored by Zeisler has been published in partnership with Giles in conjunction with the exhibition. The lavishly illustrated book focuses on the recent research into Fabergé, providing revelations from the Russian public archives, and the discovery of objects thought to be lost that have brought to light new information about Fabergé’s career and his creations. With new photography and illuminating focus spreads by Fabergé experts, this new volume presents the firm in the broader history of 19th- to 20th-century jewelry and goldsmithing, documents new attributions and provenances, and examines our continuing fascination with Fabergé’s remarkable work.